Providing you the best range of tyre mounted bitumen sprayer, bitumen sprayer, truck mounted bitumen sprayer and bitumen mixing plant with effective & timely delivery. 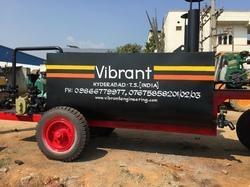 Our company manufactures premium quality Tyre Mounted Bitumen Sprayers since its incorporation.The product manufactured by us is compact in design and requires low maintenance. 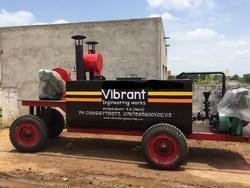 Vibrant Construction Equipments Pvt Ltd is engaged in manufacturing premium quality Bitumen Sprayer since its incorporation. The product manufactured by us is compact in design and requires low maintenance. 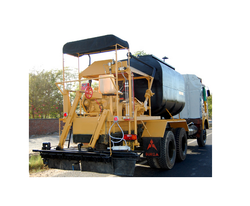 We have emerged as the foremost manufacturer and supplier of the Truck Mounted Bitumen Sprayer. 3. 25 H.P Air cooled KIRLOSKAR Make diesel engine, Compressor, Digital tachometer with sensor for visual display of speed in M/min. 1. Exclusively suitable Tata OR Leyland truck chassis of 17 Feet or More after driver’s cabin. 3. Minimum Height of the Chassis - 45 " / 1150 MM.